Bioluminescence is the visible creation of light by an organism through a biochemical reaction. It is produced by the sudden transformation of a high-energy molecule into a lower state of energy. The difference in these energy levels is emitted as one photon of light. Many living things are actually able to generate light but only some of them are bright enough to be noticed. Even human bodies emit small portions of biophotons, 1000 times lower than the sensitivity of our naked eyes. Interestingly the body glow changes throughout the day, with its lowest point at 10am and its peak around 4pm in the afternoon and is completely independent of body surface temperature and heat emission . Some of the oldest written records of bioluminescence observed in nature date back to 1500 – 1000 B.C. in China, however it was not until the rise of European Alchemy in the 16th and 17th centuries until the intellectual foundation allowed studies in order to understand such phenomena . 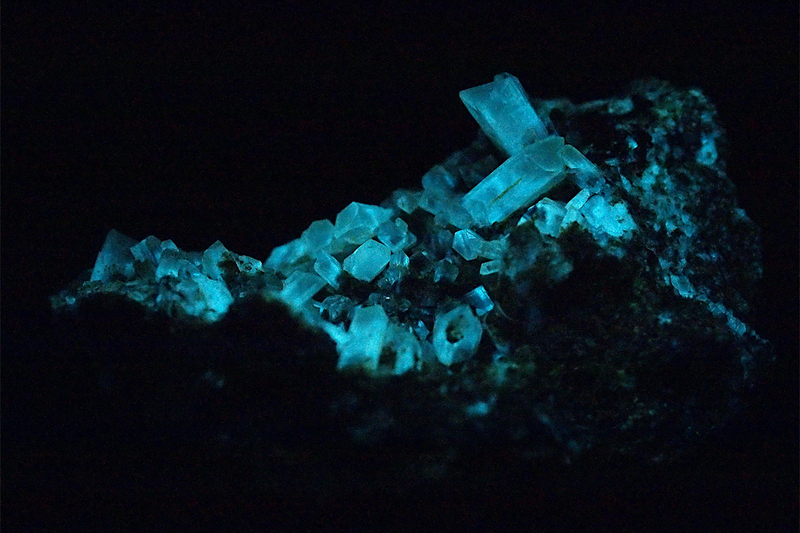 One of the earliest and most influential discoveries (of inorganic luminescence) was the “Bolognian Stone”, also referred to as “Litheophosphorus”, by Vincenzo Casciarolo in 1602, a mineral, today known as Barite (barium sulphate), which was magically able to accumulate light when exposed to the sun and to release it during darkness. The first modern study of bioluminescence was performed on a Pyrophorous click beetle by French pharmacologist Raphael Dubois in 1885. He was subsequently able to extract the two key elements of the bioluminescent reaction and when recombining them produce light . He concluded that the phenomenon was chemical in nature and coined the terms “luciferine” for the light-producing substance and “luciferase” for the enzyme that triggered the reaction. A.) Schematic illustration of experimental setup. B.) Image of the subject under light illumination. C.) Image at 10:10am. D.) Image at 13:10pm. E.) Image at 16:10pm. Today we know that bioluminescence is generally the result of the oxidation of a light-emitting molecule (luciferin) together with a catalyzing enzyme, either a luciferase or a photoprotein, which is a luciferase variant that merges factors required for the light emission in a single unit. The reaction is highly efficient, turning 98% of its energy into light, and only loosing 2% as heat. Both luciferin and luciferase are generic terms rather than the names of certain chemicals, meaning that lots of different substances can lead to the reaction and it is estimated that bioluminescence has independently evolved at least 40 to 50 times among existing organisms . The most prominent terrestrial occurrences have been witnessed among insects, mushrooms and bacteria. The best-known, earliest documented and widest spread luminescent organisms are luminous beetles, representing roughly 3000 species classified into three families: fireflies, click beetles and glow-worms. 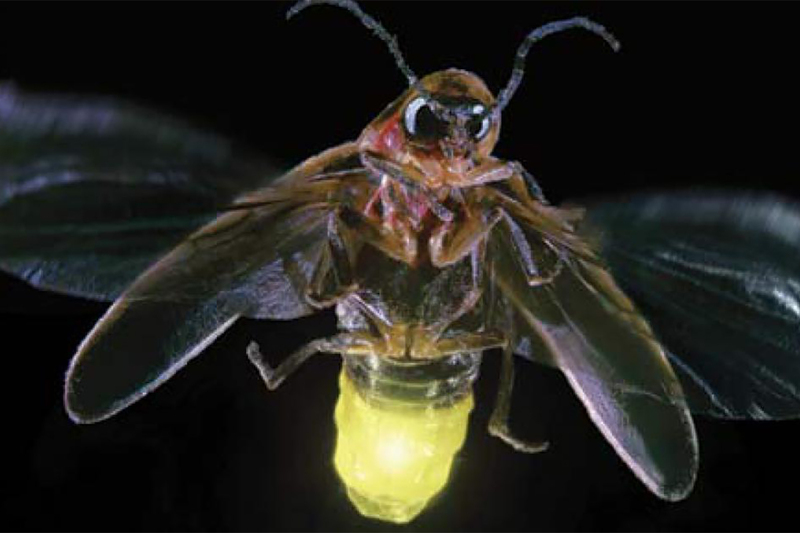 Fireflies and glow-worms are grouped into the luminescent beetle family Lampyridae. They usually light up after the sun has set and display a variety of emission ranging from strong flashes to a steady continuous glow. It is assumed that the light emission among adults forms the basis for sexual attraction and communication among the species. The light is produced in areas of the body referred to as lanterns, which vary in size and location but are usually on the underside of the last abdominal segments. As in most luminescent organisms the chemical reaction is driven by the enzyme luciferase, which produces light in the combination with adenosine triphoshpate (ATP), oxygen (02) and Magnesium Ions (Mg2) in several steps. During the first step of the reaction firefly luciferin and ATP join with luciferase. In the next stage an acid anhydride is formed between the luciferin and adenosine monosphate (AMP), releasing pyrophosphate (PPi). This is then oxidized, generating dioxetanone, which during the final stage through decarboxylation leads to the formation of oxyluciferin in a singlet electronically excited state that quickly converts to its ground state releasing a photon of light with a peak around 530nm . 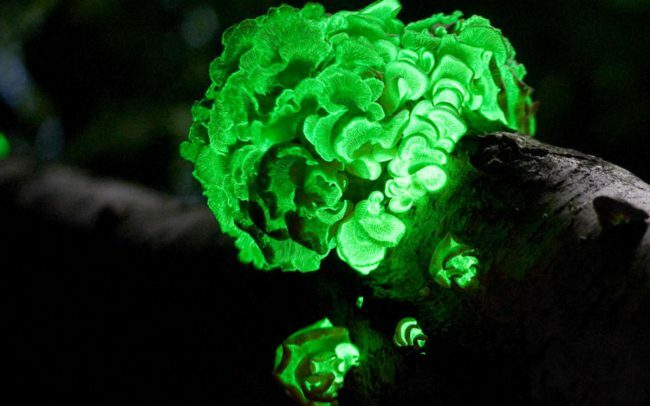 Foxfire is a gentle bioluminescent glow coming from the forest soil or dead wood that can be observed during nighttime. Its source is rapidly growing fungal cells consuming decaying wood. In total over 50 different species of luminescent fungi have been identified, mostly in tropical environments, with the majority belonging to the group of white-spored Basidiomycetes . 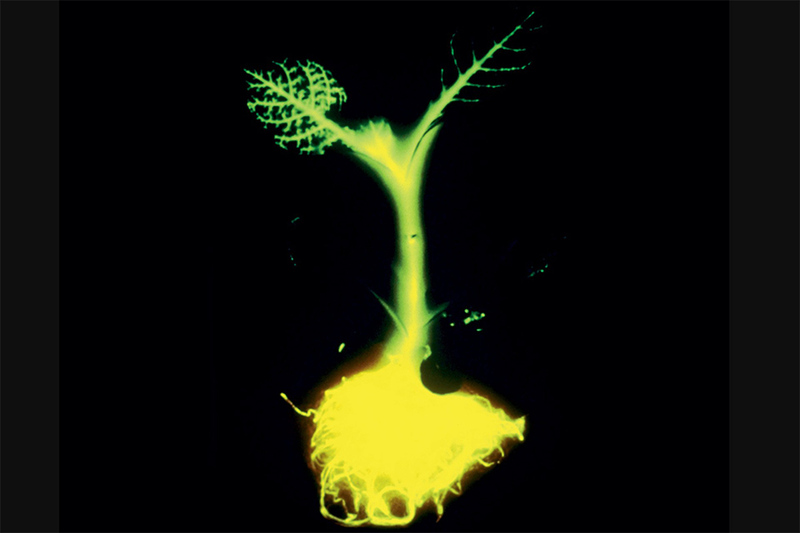 The biochemical reaction is a two-step process during which chemical energy resulting from respiration or photosynthesis is loaded onto a fungal luciferin molecule and is then – in combination with oxygen and luciferase – transformed into water, low energy luciferase and a photon of light . Both the involved luciferans and luciferases remain largely unidentified. The produced light is usually in the greenish spectrum and very dim with a maximum around 520-530nm. 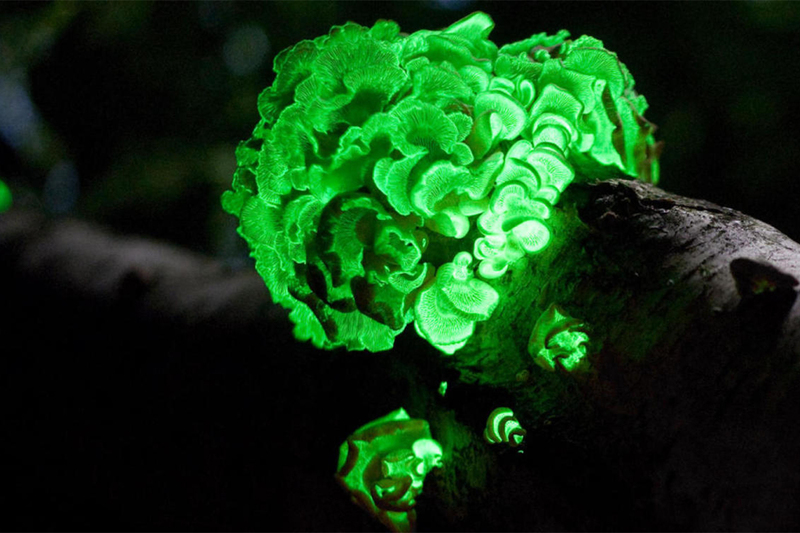 While the true purpose of fungal bioluminescence is unknown it is generally believed that the light attracts insects to spread its pores or acts as a deterrent towards nocturnal animals. Bacterial Bioluminescence is the widest distributed source of organic light emittance. Luminescent Bacteria are all Gram-negative, non-spore forming and motile . While most of them can live independently, the majority is found in symbiotic or parasitic relationships with host organisms. By now eleven species have been classified which can be divided into four genera: Photobacterium, Vibrio, Alteromonas and Photorhabdus . Species existing in marine environments are generally assigned to the first two categories; terrestrial ones belong to the latter. Bacteria belonging to the Photobacterium genus are in most cases light organ symbionts of marine animals while the Vibrio species exist both as free-living and symbiotic types. In bacterial bioluminescence the luciferase enzyme is composed of reduced flavin mononucleotide, molecular oxygen and long-chain fatty aldehyde. The reaction leads to the oxidation of FMNH2 and aldehydes and results in the emission of blue/ green light with a maximum around 490nm . 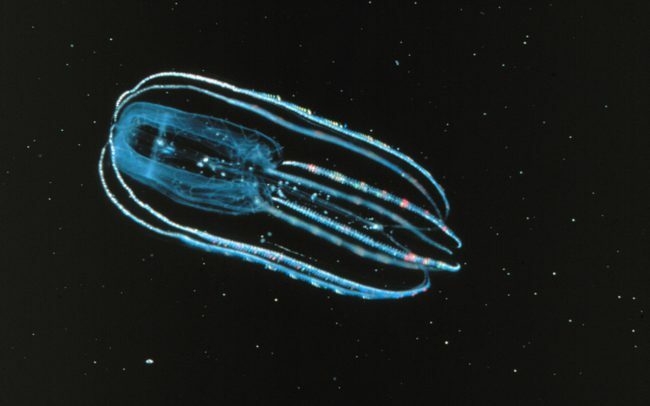 While bioluminescence can be observed among a large variety of organisms, most actually exist in the ocean and in particular the twilight or disphotic zone, which generally extends from about 200m – 1000m depth. 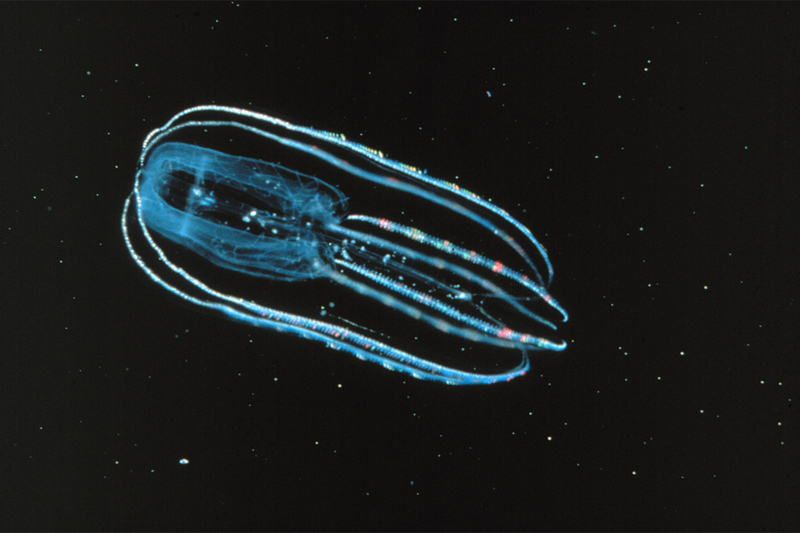 While the divergence from marine to terrestrial bioluminescence is not fully understood and mostly assigned to the oceans’ comparatively stable environmental conditions that is favorable for a long uninterrupted evolutionary history, it is estimated that about 90% of animals living below 500m have luminescent capabilities . With the seawater not only absorbing red, orange and yellow sunlight but also significantly changing its intensity about tenfold every 75m , most of the visible light that reaches this area is in the blue/ green spectrum. Firefly at night with its abdomen lit up. Lobate ctenophores are translucent and give off a bioluminescent glow. Subsequently the majority of marine organisms are only sensitive to blue light and hence luminescence in a spectrum of 440 – 479nm. 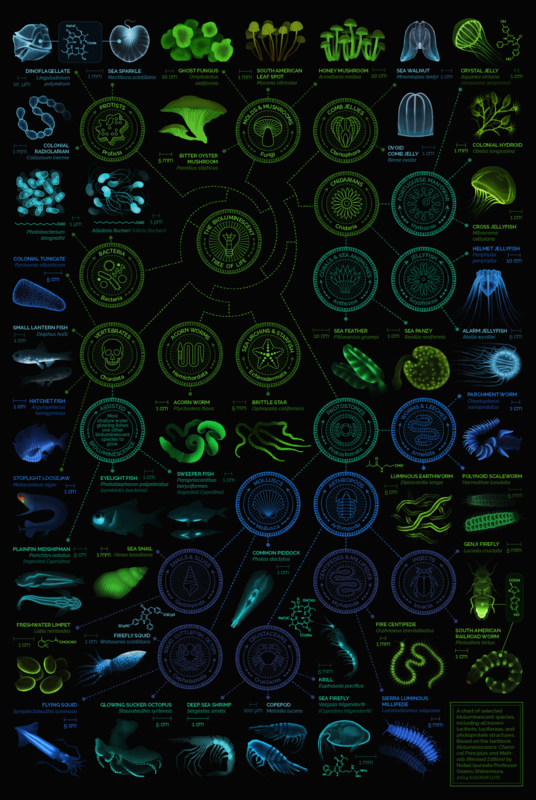 Oceanic Bioluminescence is mainly created by four distinct luciferins, bacterial, dinoflagellate, ostracod and coelenterazine and can be observed among a variety of species with dinoflagellates representing the most commonly encountered organism next to fireflies. In large accumulations they can form spectacular natural phenomena but also potentially toxic red tides . Bright flashes might be used as defense by startling and intimidating approaching predators. Ventral photophores match the dim light coming from the surface. This counter illumination makes a dark body disappear from below. Glowing lights can work as a lure and attract potential prey. Bright colors and patterns might be used as apostematism and repel predators. Some fish are able to produce red light, which allows them to illuminate their prey without being visible. Signaling patterns are used as means of reproduction related interspecific communication. In some cases light emission might not have a specific function and simply constitute a metabolic byproduct. In 1986 scientists at the University of California successfully transfered the gene from the firefly that produces its chemical glow into a tobacco plant. In 2003, Professor H.J. Tsai at National Taiwan University developed a method to make otherwise colourless fish shine neon green using a protein extracted from jellyfish. These advances gave rise to a more ambitious project, offering to spread the technology in the public domain – The glowing plant project. 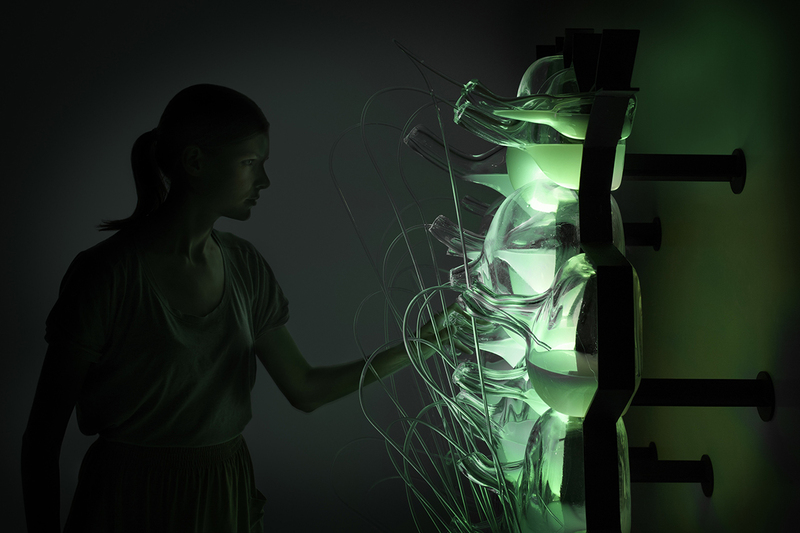 In April 2013, a small group of California based “biohackers” started a Kickstarter campaign to crowdsource their plan to synthetically engineer a glowing plant, and exceeded their initial goal of $65000 by more than seven times. The first seeds are supposed to be sent out to over 8000 people early 2014. The plant which is ought to become a sustainable alternative to light bulbs and street lamps obviously started intense controversies concerning ethical, moral and environmental issues due to its unregulated nature and the unknown implications a genetically engineered plant could pose to nature. Bioluminescent Research targets many areas, including genetic engineering, biomedical applications or military uses. Inspired by the symbiotic relationships of luminous bacteria and their host organisms, studies in architecture and design consider the potential application of similar bacteria in a spatial or material context. Projects include bioluminescent trees that photosynthesize during the day and emit light at night , conceptual ideas for zero-electricity lighting  or internal ambient light effects . 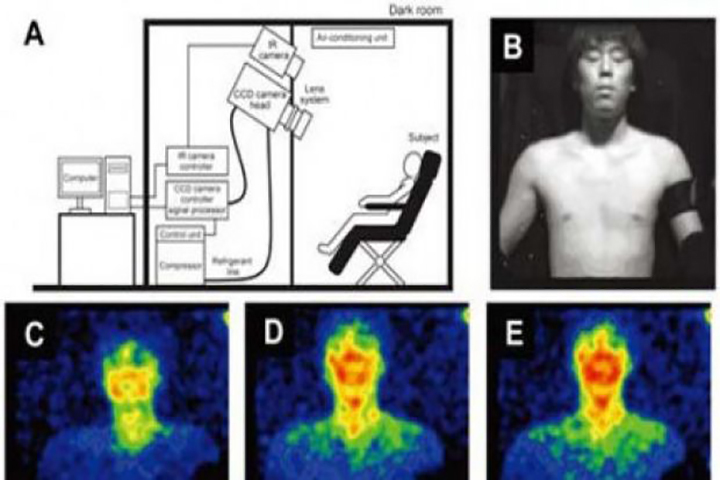 Masaki Kobayashi, Daisuke Kikuchi, Hitoshi Okamura (2009), “Imaging of Ultraweak Spontaneous Photon Emission from Human Body Displaying Diurnal Rhythm”. In: PLoS ONE, 4 (7). Aldo Roda, “The Discovery of Bioluminescence: The Bolognian Stone“. In: Bioluminescence and Chemiluminescence: Perspectives for the 21st. Century, Eds. A. Roda, M. Pazzagli, L. J. Kricka, P. E. Stanley (New York: John Wiley & Sons, 1998). John Lee, „Bioluminescence: the First 3000 Years (Review)“. In: Journal of Siberian Federal University. Biology 3 (2008 1), p. 194-205. Steven H.D. Haddock, Mark A. Moline, James F. Case, “Bioluminescence in the sea”, In: Annual Review of Marine Science 2009, p. 447. Dr. Kim D. Coder, “Foxfire: Bioluminescence in the Forest“, 1999. Dunlap, P.V. 2009. Bioluminescence, microbial, pp. 45-61. In M. Schaechter (ed. ), Encyclopaedia of Microbiology, 3rd edition. Elsevier, Oxford. Charrier, T., Durand, M., Affi, M., Jouanneau, S., Gezekel, H., and Thousand, G.(2010). Bacterial Bioluminescent Biosensor Characterisation for On-line Monitoring of Heavy Metals Pollutions in Waste Water Treatment Plant Effluents, Biosensors, Pier Andrea Serra (Ed. ), 2010. Leo Yen-Cheng Lin, Edward A. Meighen, “Bacterial Bioluminescence”, Department of Biochemistry, McGill University. Tamara Frank, “Visual Ecology and Bioluminescence”, Harbor Branch Oceanographic Institution. Edith Widder, “Deep Light”, Harbor Branch Oceanographic Institution. Steven H.D. Haddock, Mark A. Moline, James F. Case, “Bioluminescence in the sea”, In: Annual Review of Marine Science 2009, p. 455. Ow, D.W., Wood, K.V., DeLuca, M., de Wet, J.R., Helinski, D.R., Howell, S.H. (1986). “Transient and stable expression of the firefly luciferase gene in plant cells and transgenic plants”. Science 234 (4778) (American Association for the Advancement of Science). pp. 856––856. ISSN 0036-8075.